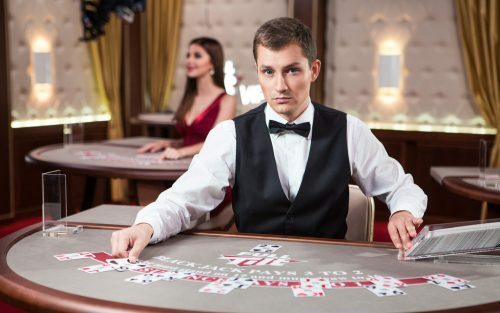 There’s a good reason blackjack is one of the most popular casino games in the world: Players can use strategy to increase their chances of beating the casino. In this article you’ll get the most important blackjack strategy tips and tricks as well as a launching pad to take your blackjack strategy education all the way to expert-level. The truth is, blackjack is an incredibly complicated game and it takes tons of practice and a good memory to play perfect blackjack strategy and potentially become a winning blackjack player. Add card-counting to that list of skills and blackjack is a game that continues challenging players for years and years. We’ll start with a simple beginner strategy for blackjack that can get you playing right away, then move on to more advanced concepts like card-counting and some of the common mistakes that even experienced blackjack players make. If you need to brush up on the rules, read our in-depth article on how to play blackjack. Even though playing perfect blackjack requires a lot of work, there are a few main points you can learn right away that will get you 90% of the way there. Follow these rules and you’ll be playing better blackjack than most of the people in the casino. Always hit on a hard 8 or less. Always hit on a soft 15 or less. If you have 10 or 11, always double if you have more than the dealer’s up-card. If not then always hit. Surrender 16 when the dealer’s up-card is a 10. Stand on hard 12 to 16. Double on soft 16 to 18. Split 2s, 3s, 6s, 7s and 9s. Blackjack hands move quickly and it’s easy to make mistakes but if you’re making the same ones over and over again, it’s going to cost you a lot of money. These are the top five most common and most damaging mistakes you need to avoid. Taking Insurance: When the dealer’s up-card is an ace, some casinos let you make a side bet on whether the dealer will get a blackjack (an ace and any 10-point card). The rules of insurance can vary slightly from casino to casino but it’s always a terrible deal for the player. Insurance pays out 2 to 1 on the player’s side bet when the dealer gets a blackjack but the chances of getting a blackjack are much worse than that. Taking insurance will give the house a 7.7 per cent edge on that side bet. Splitting Tens When Dealer Has 6: Splitting tens seems like a no-brainer but when the dealer’s showing a 6, it’s a big mistake. Like we said before, the dealer is at his most vulnerable showing a six and will bust about 42 per cent of the time.When you split tens, each hand has a roughly 18 per cent edge over the dealer’s six but if you stand on a 20 you about a 70 per cent chance of winning. Not Hitting Soft 18 When Dealer Has 9: It’s tempting to stand on soft 18 but when the dealer’s showing a nine, he’s going to hit 19 or better around 28 per cent of the time. You should always hit in this spot.Another similar but more obvious mistake is not hitting a soft 18 with the dealer is showing a 10 or an ace. Not Doubling on Soft 18 When Dealer Has 6: The dealer is at his most vulnerable showing a 6; he’s going to bust roughly 42 per cent of the time. That’s why you want to pile on the bets when the dealer is showing a six.Doubling when the odds are in your favour is really important. You have soft 18 so you can’t bust and even when you get a low card, the dealer is going to bust almost half of the time anyway. Not Hitting Hard 16 When Dealer Has Ace: When you have hard 16 it’s a tough spot because hitting will make you go bust about 62 per cent of the time. The problem is, when the dealer’s showing an ace he’s going to make 17 or better about 83 per cent of the time.That’s why you have to gather your courage and hit hard 16s whenever the dealer is showing an ace. Not doing it will cost you a 15 per cent edge on that decision. You should also never split tens when the dealer’s up-card is a five. Counting cards can turn the odds in your favour but if you’re doing it in a brick and mortar casino, watch out. It can just as easily get you thrown out of the building and barred from ever coming back. As a recreational blackjack player, however, there are safe ways to use card-counting systems to win more money without getting yourself escorted to the parking lot. The first thing to know is that the fewer decks of cards being used in the game, the easier and more effective card-counting will be. Lots of casinos offer low-stakes single or double-deck games, which is a perfect place to try this out. Let’s start with the basics. Card-counting is about understanding the distribution of different value cards still left in the deck, or “shoe” as it’s called in blackjack. By keeping track of the cards being dealt, the player can increase or decrease the amount they’re betting based on whether the remaining cards are favourable. As each card is dealt, keep a running count based on these values. The higher the count, the bigger you should make your bets. This is because the odds are better for the player when there are more 10-point cards and aces left in the deck. The count explained above is called the running count but if you’re playing in a game using more than one deck of cards, the running count becomes less useful. The more decks in play, the less accurate the running count becomes. To find the true count, just divide the running count by the number of decks being used. For example, if you’re playing in a one-deck game and the running count is +8, it’s a great spot to make bigger bets. If it’s a four-deck game, however, you have to divide that number by 4 which gives you a true count of +2. Once you know the true count, you can calculate your edge in the game. Every point of the true count translates to a 0.05 per cent change in your odds of winning. If you’re playing proper blackjack strategy the house edge is about half a percent so when the true count is +1 the house edge disappears. When the true count is +2 the player now has a half percent edge, and so on.